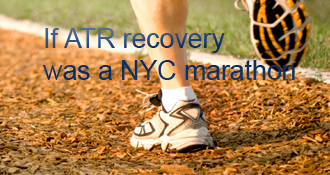 hollymt5 has completed the grueling 26.2 ATR miles to full recovery! Just when I feel like I am making such great progress, I realize how far I still have to go. I started driving on Sunday. While I have great control over my right foot, I still am paranoid about the chance of re-rupture. I have to use my left foot to really brake hard or to rest at a stop light. It’s super inconvenient because I have to use my boot until I get to the car, change into my sturdy shoe with a heel lift, and then change back into the boot once I get where I’m going. But, I’m thankful for at least being able to run out to show a house or pick up the kids, if needed. I still have my hired driver but she goes back to school in a week so I won’t have that luxury soon. I did transition to sleeping without the boot. That’s a nice treat although again, it’s a pain to have to put it back on if I have to get up in the middle of the night. My ankle doesn’t feel any tighter in the morning when I put the boot back on so that’s good. Physical Therapy was painful today. She had me add weights to my seated toe raises and really added a lot of weight to the side lifts (on my side and weights strapped to the top of my foot. I have to lift my foot and slowly lower it.) The most painful part was the scar tissue massage and the calf massage. Ouch! I’m so glad she is getting in there but man, it hurts. She reminded me that if it hurts, it means it’s still connected. She also has me on the stationary bike for 10 minutes with little resistance. We talked about transitioning from the big achilles sole on the Vacocast to the flat sole. She said she likes to do changes every 2 weeks if there aren’t any problems. Since I just went down to 5 degrees a week ago, I’m going to wait until next Monday to try the flat sole. Both my ortho and physical therapist really don’t want me going to 0 degrees quite yet. I’m fine with waiting as it seems I’m making progress with strength. I tried Pilates at a local studio on Monday. That was interesting. I’m still not sold on the effectiveness of it but I think it will be a good balance to the weight training twice a week. I was super concerned about hitting my foot or her bumping into it but she tried to clear everything so I wouldn’t worry so much. She really worked my good ankle to make sure all of the little stabilizing muscles are strengthened in case I trip or need extra support on the good foot. Congrats on the progress, good luck with more. I’m finding I’m not a patient person. Thank you, Metonia. I am SO not a patent person but had to figure out how to be after the re-rupture. I realized this is going to just keep happening if I don’t settle in to the reality that I have to be more careful and patient. good Download Mobdro. Start web browser iphone app and therefore mouse click on the pursuing hyperlink	great. good SHAREit features really fast data file copy quickness, 200 circumstances faster than Bluetooth.nice. Hi Holly, I have had a year of issues with my leg after a car accident. Broke my femur and tore my femoral artery. I developed compartment syndrome and nearly lost my leg. I have drop foot and used a AFO for 6 months. 3 weeks ago I had Achilles lengthening surgery. I would reccomend an AFO branch for protection and to prevent you from bad walking habits that could develop. The one thing I don’t reccomend it ordering an AFO off the Internet or taking a friends. A good AFO will cost about $1,000 and are specifically designed for you by taking a mold of your foot and leg. Do you self a favor and find a orthotic or prosthetic provider in your area and pay to have one made. Holly, I was given a foot-drop brace from my foot doctor prior to the decision to have the surgery to help the pain. It fitted on top of the foot and ankle and padded velcro wrapped around the bottom of my foot/toe area and across the back of the calf. Because of how it fits across the back of the calf I don’t think it would help and may even harm. It also does not allow for angle adjustments and pulls your toes/foot up. Because the foot is kept in a 90 degree position it doesn’t allow the tendon to relax. I’m thinking this would strain the tendon and effect the healing. Let me know what you find and how it works out, Holly! Manny, It’s so good to know that I’m not alone in being worried about this kind of exercises. I was horrified at the thought! But, I did the today at home for the first time and my foot actually cooperated. I guess I’ll trust my PT even more now. Bryanb, thank you for the words of encouragement. If you didn’t have any wedges, then I might be overthinking this whole thing! That’s good to know that it’s possible. Karren, I think you’ll really like PT. It’s a love/hate thing because I love the progress I’m making but hate the process of getting there. It really is nice to ask them the practical questions to find out how you really make this transition. I hope it goes really well for you! Sounds like you are doing great. I’m about 5 1/2 weeks post non-surgery. I’m pretty far behind you so I like hearing how things go for you. Keep up the good work and keep us informed. You are a warrior. I’m so happy to hear that your tendon isn’t as tight and doesn’t hurt this time around. I didn’t have a Vacocast. I just went with the normal Moon boot and I didn’t have any wedges. The doc just told me to start walking in it. Wish I had some insight for you. Glad your PT is going well and you’re advancing so well. Keep up the amazing progress…!!! Holly, you are one week ahead of me on this second go-round of yours, and I hope my therapist does not have me do the exercises you were given this week! My ankle hurts just from reading about it! LOL…. Though, seriously, I’d do it if the therapist tells me to… but I will be petrified! Beanie- Thank you so much. I won’t worry about switching the sole then. They actually still have me at 5 degrees so I’ll just hang tight with the way it is now. I love that- couch squats! Regarding the Vacocast … I tried to use the flat sole when I was at 0 degrees but it always caused me pain at the back of my knee and sometimes with too much of a stretch on the achilles. I couldn’t get it to roll like the wedge sole, so my knee would end up hyper-extending or pushing backwards and this was really uncomfortable and painful. I also walked much slower with it. Since I had an EvenUp and no problems walking with the wedge sole, I decided it didn’t matter if I kept using the wedge sole since my foot was still at 0 degrees while I walked. Hi Karren, I was similar to Gav and only tried the flat sole once the boot was neutral but I hated it because my knee kept hyper extending when I walked and it hurt the knee. So I just carried on with the wedge sole even at neutral. I walked faster and more comfortably with the wedge sole and my foot was still at 0 degrees so I figured it didn’t matter which sole I used. Good luck! I really think I was just doing too much too soon. I started PT 3 times a week at week 3. I was thrilled when I was driving by week 6 and then moving into shoes at week 8-9. I re-ruptured 5 days after ditching my boot (in my 9-10th week.) I just took a step up onto a curb in a parking lot and my whole foot wasn’t on the step completely. My heel dipped down and I felt it tear again. I was devastated. I went to 3 different doctors (Including my original surgeon) and all said my best option was non-surgical route. I have been much more conservative and just started physical therapy at week 7. This physical therapist isn’t stretching at all but is working on strength (to the point of my foot shaking at the end of the set) and a painful massage of the calf to loosen it up and my scar tissue. I really think you’ll be fine with not starting PT until now. I am happy I waited this time and feel so much better than the first go around. I am non surgical in a vacoped, 10 weeks in.. i was fwb by 5-6 weeks but could not put the flat sole on until about 8 weeks when the boot was in neutral as I found it awkward to walk before this. Holly thank your for getting back to me. So, this is a re-rupture for you. I’m sorry to hear that. How did it happen? I’m new to this site so I apologize for asking. I’m trying to heal this the best way possible (like everyone) and I think you get better info here than the doctors. Is there a way to follow what you have already posted? Thanks for your response. he only relief I get is also from the boot off and my husband gently massaging my foot. How long did it take you to go without crutches? I’m going to keep the large heel on until I see my doctor this Friday. She hasn’t ever dealt with the vaco cast so I’m trying to make sure I’m informed (through this website) as how I proceed. My doctor does not want any PT until 8th week and that makes me nervous too. I feel I need to be doing some little things to progress. What is your protocol? This is the craziest thing that has ever happened to me!! Sometimes it does get the best of you. Karren, I remember having a lot of swelling type discomfort during that period. We were on our cruise and I just assumed that maybe I was scooting around more than normal. It wasn’t too easy to ice there so I really didn’t do that too often. I just tried to elevate as much as possible. That has since all gone away and I don’t have any of the swelling discomfort that I did then. I didn’t transition to FWB until week 5-6 so maybe you just did it a little early? I was told to stay in that big achilles sole until week 10. I know that’s later than some but after re-rupturing my achilles the first time, I’m being more conservative. I’m working out so my hip and knees aren’t bothering me so I figure I’ll keep on it until my PT tells me to switch. Haha- so I am supposed to keep my feet flat on the floor and raise my arch (it doesn’t go far) and hold for 2-3 seconds then release. The windshield wipers are where I sit with my feet flat on the floor (I’m at at 5 degree DF now so it makes me nervous but doesn’t hurt), make fists with my hands and put them side by side between my knees (for spacing, I assume), and then make my toes go parallel to the floor in a windshield wiper motion. I go back today so I’m looking forward to a new set of exercises! Hi, Karen! Swelling that’s not really swelling… I think that is me. Mind you, I have had edema in my ankle for ages, so maybe I’m just used to it, but at 7 weeks, doing full weight in the boot, with one wedge, and getting ready for my fifth Physical Therapy session this afternoon, I regularly feel my foot is under pressure after walking a while, and it feels tight … and this is worse if I am wearing compression socks, driving me batty and making me cranky. Raising the leg helps a little, Icing the raised leg brings quick relief, and resting the foot by taking off the boot and sock while raising the leg helps a LOT. Being overweight results in lower back discomfort after walking around, too. I’m starting on my 5 week post rupture. I went non-surgery. I have a vaco cast boot. I have been fab for the last week. Although I had to stop due to swelling and pain. I. Back to fwb but not exactly sure if I should still have the large heel on or switch to the smaller one? Does anyone have a feeling of swelling but not really swelling? Just uncomfortable. Sort of like a numb feeling. Just seeing if anyone has any suggestions. Thanks this site is very helpful. Holly I think it’s great that you argued for the boot instead of the cast and won even though your Thompson test was failing, and that now you and your doctor can see that the boot was just as effective and you’ve been more comfortable through-out. It’s difficult to advocate for yourself and you’ve succeeded. Congrats! Awesome info in these posts too, thank you! Country Boy J, I’m sad for you that you have to go through this again?! Yikes. But yes, I’m so thankful for the Vacocast. It has made my life so much easier and has allowed me to stay in it longer during the protective stages. Holly - good call on the gear. I was given an Aircast Elite splint and crutches. (I rented a scooter and bought an “EvenUp” shoe platform) I don’t think anyone at Aircast has ever worn that splint product for more than a few minutes. The bottom of my foot sweat like crazy (even in a New England winter) and made my foot burn. The sole on the Aircast is unnecessarily tall/thick which threw my hips and back out of whack when I went to PWB (before buying the EvenUp shoe). Had to see my doc and chiro for that issue. Next foot I am getting the Vacocast, a Cryo-cooler (to help with swelling [avail on Amazon even]), and possibly forearm crutches. Karan, our community is based on helping each other! So please do post your experiences and results! Manisha, going to work is something that will take planning and strategizing, since even a moon boot, with its advantages, or a kne crutch which leaves your hands fee, require training and developing new abilities. for example, I work a lot on a computer, but now have lower back pain and muscle cramps that make it very uncomfortable to stay in one position for a period of time… And I can’t be standing for long periods, either! So I have to admit that I am slower at getting things done, do my physical therapy, and found that a shiatzu massage pillow was my best friend! (and compression socks are a necessary evil and torture mechanism). You will find your own truths and solutions, so just stay positive and post your thoughts and experiences so the rest of us can tell you if we’ve tried it, too. Well I found this tutorial very well man! Thank you, Manny and Beanie. The good news is that this recovery is much easier than the first. I have virtually no pain, tightness, or swelling. I’m also in the boot a lot more though. Hope your weeks are great! Thank you Holly for all the great details and explanations. They help me a lot, specially because I am terrified of a re-rupture. As for Beanie’s comment on 3 re-ruptures this week, all I can wonder about is all the guitarists that have been climbing that stairway to heaven these last couple of weeks… another big statistical bump, and an emotionally painful one. Loved your explanation of the two chair bathing technique, and the comments on the way you evened up your two feet. Arg no Holly, I’m so sorry! It’s a really good lesson for us all that we have to be super careful and make sure the whole foot is placed before putting weight on it. You sound like you’re a very positive person and are already working well through the second rehab. I hope everything goes smoothly this time and you don’t experience any setbacks. All the best and happy healing! Hi Beanie, Thank you for your sweet message. This is the first time I have blogged anything so it was kind of therapeutic to re-live it all. So, my re-rupture…. My doctor had encouraged me to move into shoes. Looking back, I remember every step just felt tight. I had been running errands that day (stupid things like buying candles and things to ice Christmas cookies, nothing totally necessary) and was so proud of myself for doing them in my shoes. I came out of the grocery store, was crossing the street, holding grocery bags and looking for my keys. I was slow because I still couldn’t take big steps but rushed because there were cars coming. I stepped up onto the curb but only the front of my foot was on the curb. My foot wasn’t strong enough to hold up my body and the heel dropped, re-rupturing my achilles. I knew right away. This time around, I bought a Vacocast so I can stay in it a lot longer and still have some movement. Hey Holly, I’m so sorry to hear that you re-ruptured and are starting again! My heart goes out to you and I wish you the best on your second recovery. You write really well and I can’t believe that you are able to remember all this with so much detail so long after it happened. I’m nervous to hear how and why the re-rupture happened. So far three people this week have blogged / commented with re-ruptures. Since I’ve been on the site you guys are the only active posters with re-ruptures so it seems like a lot suddenly and I really feel bad for all you guys! Keep up the excellent blog and happy healing to you! hollymt5’s AchillesBlog is proudly powered by WordPress and WPDesigner..